For the past year, American Boiler Company has been laying the groundwork for its expansion into the NYC market. 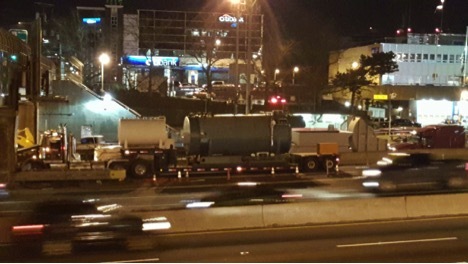 All the preparation and administrative filings finally culminated in a dramatic nighttime transport of a 600 HP boiler over the George Washington Bridge on a chilly night in January. The boiler was headed to a 45 story high rise building under construction in Long Island City. With the colder weather moving into the region, it was critical to get the boiler in place so that construction could continue uninterrupted. The NYC market for emergency boiler rentals represents an enormous opportunity for American Boiler Company. Until recently, the regulatory and administrative obstacles have prevented American Boiler Company from deploying its fleet of mobile boilers in the city. But American Boiler Company met the challenge head on. The company established an office in Midtown, hired a NYC Licensed Oil Burner Installer, acquired the necessary insurance coverages, and assembled a highly experienced team of engineers and expediters to assist in all filings required by the NYC DOB, NYC DEP, FDNY, and others. American Boiler Company is now capable of deploying boilers in self-contained trailers throughout the city. These mobile boilers range in size from 100 HP to over 600 HP and can operate on either oil or natural gas. American Boiler Company has the expertise to deliver and install boilers of all sizes for a wide range of applications from heating multi-family apartment buildings to industrial processes. For more information about our boiler rental services, please call American Boiler Company at(973) 923-1999 or email us at info@americanboilercompany.com.